The global macroeconomic climate right now is concerning across the spectrum of financial interests. The Brexit vote two weeks ago has deepened volatility in European markets and “locked in” problematic forces that were already in play, such as the widening gap between the strong dollar and foreign currencies. Meanwhile, bond yields throughout the world are down, sometimes to a disturbing degree, with negative 10-year yields in Germany, France, and Japan. Here in the US, 10-year treasury yields have slowly marched downward, from a 2.21% average yield in the second half of 2015, to an average 1.83% yield in the first half of 2016. For investors, the depressed bond market severely undermines a key instrument of safe, predictable income. At the time of writing, the 10-year treasury yield is a meager 1.38%, which barely outpaces inflation. Although more volatile in short-term time frames, the stock market may be a better bet for those seeking a predictable but non-measly stream of income from their invested capital. A dividend growth strategy in particular could be prudent to achieve higher total returns over the long run while also enjoying a stream of income. For those who don’t need the income, reinvesting the dividends can lead to even better total return, as shown in this Goldman Sachs paper and in plenty of other articles on the Internet, including ours. We’ve put together a watchlist of 17 stocks we like for income investors given the current environment. Specifically we looked for dividend growers whose sales are primarily based in the US, to reduce currency risk and take advantage of the US’s relative economic stability. Below are our picks, sorted by market cap. This watchlist is available for free in the Library, listed as Picks for Income Investors – July 2016. Note that we have not done a deep dive on every one of these companies, but we believe all of them have promise for reasons this article will get into. Be sure to do your own research on a company before investing in it. 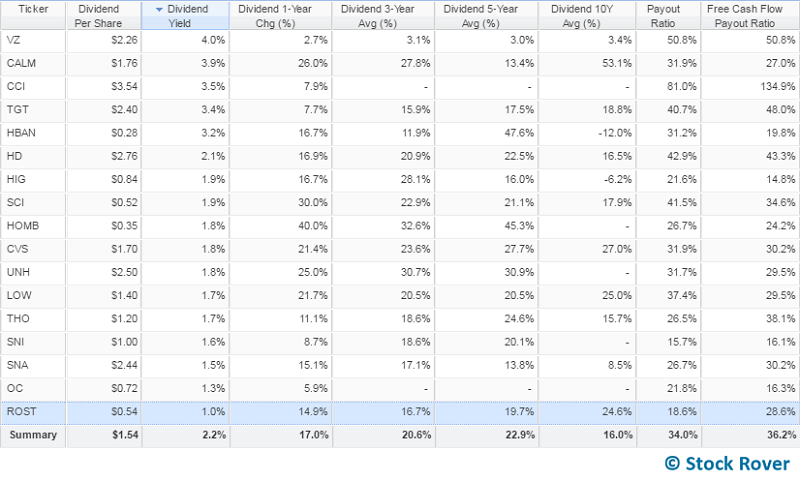 In the following table, you’ll be able to see the dividend yield, dividend per share, dividend growth over multiple periods, and payout ratios for all 17 stocks. They are sorted on dividend yield. As you can see, all stocks have grown their dividends, although some have longer track records than others. Let’s start with CVS Health (CVS), which has been one of our favorites for a while now. In addition to being a fantastic dividend grower—27% average growth for 10 years, with an increase every year—it has grown its business in a stable and financially sound manner, with a slightly increased pace of growth expected of it in the next 5 years. Snap-on (SNA) is another solid, well-rounded company we have liked for a while now. It’s got steady dividend growth, excellent financial health and profitability, and good earnings growth. Its current valuation sends mixed signals: it is slightly lower than its industry average, on the high end of its 5-year range, but the low end of its 1-year range. As you can see above, Crown Castle International (CCI) and Owens Corning (OC) are new to dividends, which inherently makes them riskier from an income perspective because they have less of a proven track record, but we believe both are on track to be dividend growers. They have each raised dividends every year since the first payout. CCI is already high-yielding, so it offers reward right off the bat. It also has a dangerously high payout ratio, but note that this number has actually come sharply down from triple digits in past quarters, so the trend is moving in the right direction. We included it on this list because we like its growth runway and we think the business is well run. CCI is one of three firms that builds out wireless data infrastructure (AMT is another one to consider), a need that is not going away anytime soon. It is very expensive by trailing P/E (80.1), but much more reasonable when you look at forward P/E (19.9). Unlike CCI, the other new dividend payer OC is low-yielding, but it also has a low payout ratio, meaning there is room to safely grow the dividend. We think OC is an increasingly profitable, financially sound company with good growth prospects—and it is reasonably priced (although the price has come up slightly since we wrote about it a few weeks ago). 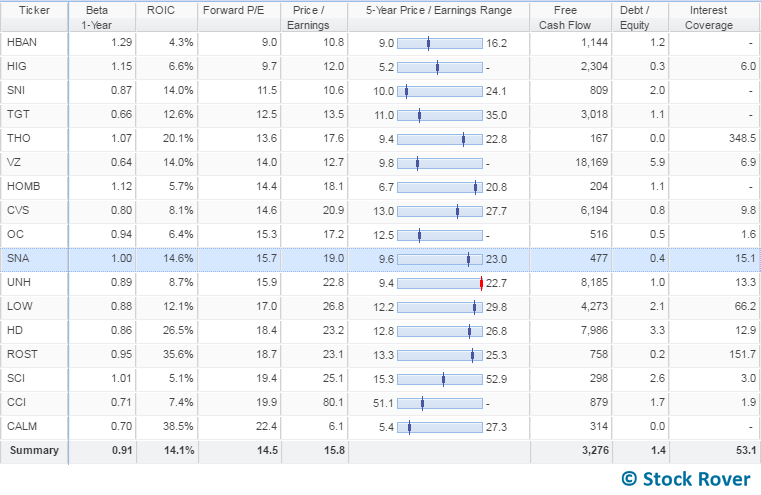 Ross Stores (ROST) is the lowest yielder of the bunch, at 1%, but it has increased dividends year over year for 10 years. The stock is a bit expensive at the moment, but read why we think it’s a great long-term pick, defying a challenging retail environment. One further point on the low yielders. ROST and OC are the only two that currently yield less than the 10-year T-note. However, even if prices were to stay flat and ROST continues with a roughly 15% dividend growth rate, it will beat the treasury yield in a few years. Likewise for OC, with just one more cycle of dividend growth at approximately 6%, it would catch up to the current 10-year T-note yield. On the opposite side of the yield spectrum, we have Verizon (VZ), which is a more of a classic dividend yielder. It has a high dividend payout and less intensive growth. Even so, it has grown its dividend every year for the past 10 years. Now(ish) might be a good time to get into this high-yielding blue chip, given its valuation, which is in the low end of its 5-year range. Q1 earnings dropped the P/E multiple from the low 20s to the current multiple of 12.6, even as the share price has increased 2% since April 1. Note that near-term earnings growth estimates have been revised downward, and Q2 earnings will be impacted by the union employee strikes that took place in April and May. The results of the strike negotiations included higher pay for employees and reorganized outsourcing rules. Another high-yielder is egg producer Cal-Maine Foods (CALM). Investors who are especially interested in a predictable income stream should be aware of the fact that despite strong overall dividend growth, CALM’s dividend payout can vary up or down from quarter to quarter. See our write-up on CALM from last year to see why we think it’s a fundamentally strong company with sound financials, despite its shockingly high short interest (51.9%). Service Corp International (SCI), the largest provider of deathcare (yes, that is a word) services in North America, and is one of the stronger dividend growers on the list. In fact, its dividend growth has accelerated, while its sales and earnings growth has decelerated, so this company may be transitioning into dividend yielder territory. Admittedly, the deathcare industry is not something we had previously researched (for some helpful background on it, see this article), so SCI is more of a wild card choice for this list, but from an income perspective we find it intriguing. The stock is expensive from an absolute perspective as you’ll see in a later table, but it is actually well below its industry average and nowhere near the high end of its 5-year P/E range. As you can see in the table, most of the picks have had double digit dividend growth while keeping the payout ratio below 50%. Even the free cash flow payout ratio, which provides a more conservative take on how burdensome the dividend payout is for a company, is at or below 50% for all but CCI. In addition to the good things that this well-managed dividend growth can do for your portfolio, it also is a positive indicator for a company’s fundamentals—it suggests they are maintaining profitability, managing finances well, and attending to shareholders. 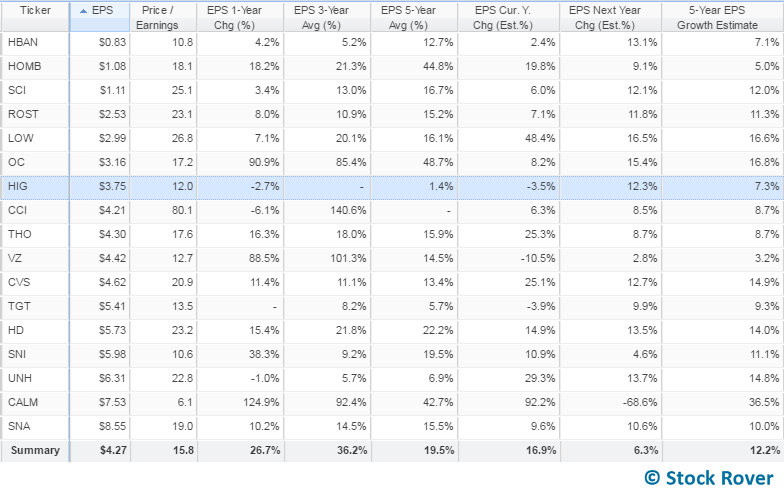 Most of the companies have a history of consistent earnings growth as well as expected earnings growth in the future. The following table is sorted on current EPS, and shows EPS average growth over the last 1, 3, and 5 years, as well as estimated growth. Most stocks on the list have experienced moderate to excellent growth, with solid future growth expected. Take a look at the summary line to see how strong the averages are. Earnings growth is the primary indicator that investors can expect price appreciation out of these stocks as well as an increasing dividend payout. A notable grower to consider is mid cap Thor Industries (THO), which makes motorized and towable recreational vehicles such as Airstream trailers. The company has had excellent growth in sales, operating income, and especially EPS. We have a lot of faith in the management team, who has steadily improved capital and operating efficiencies while keeping debt at zero. Scripps Networks (SNI) is another interesting mid cap. The company produces lifestyle-oriented content for television and streaming (think HGTV and the Food Network). Not only has the company had an impressive run of growth that is expected to continue, it has fantastic profitability metrics that far outstrip its industry averages, including a gross margin of 66.4% and a net margin of 24.4%. Our inquiry into this company suggested to us that management has been nimble and very responsive in a shifting media environment, which has largely accounted for their success so far. While insurance company Hartford Financial (HIG) is one of the weaker rows in the above table, our background research has led us to believe that it could be a good under-the-radar pick, especially at its current valuation. Its underwriting strategy is better and increasingly more profitable than that of its peers (even peers that we like, such as PRU). We also like that the company has divested itself of its unprofitable ventures in the UK and Japan over the past few years, which is especially desirable given the current global economic climate. Its future expected earnings growth is looking up too, with 12.3% estimated for next year and 7.3% average growth anticipated for the next 5 years. Only CALM has negative EPS growth expected for next year, although its 5-year estimate is 36%, so the decrease is not indicative of a longer-term decline. Home Depot (HD) and Lowe’s (LOW) do pretty much the same thing, and they both do it well. Both have great earnings growth, increasing profitability, and great dividend growth. Both companies have generally increasing trends—suggesting improving operational and capital efficiency. In absolute terms, HD has a slightly higher dividend yield and performs better in profitability metrics such as net margin, ROIC, and sales per employee. Based on their financials, we think both companies are worthy of consideration. 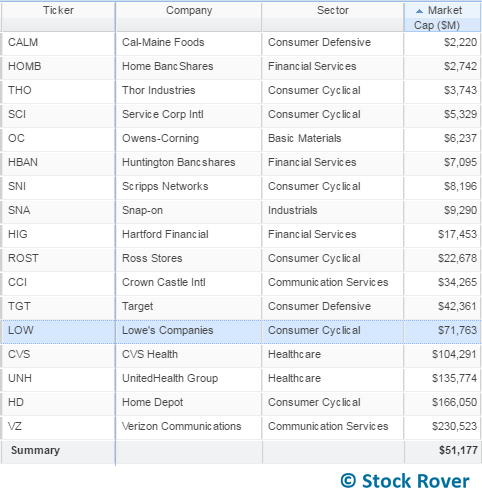 They are both, however, expensive relative to most stocks on this list. Another set of peers to consider are mid caps Huntington Bancshares (HBAN) and Home BancShares (HOMB). Although they are in the financial sector, which is generally a tough place to be right now, the fact that they are regional US-based banks should protect them from much of the global chaos. Moreover, they are likely to benefit from the US economy’s continuing modest growth. HBAN is a little weaker on the growth side, both in earnings per share (as seen above) as well as operating income and sales. However its earnings are expected to pick up next year and in the next 5 years. The stock has been crushed in the past year—we think unfairly—rendering it pretty cheap. In line with its higher growth, HOMB is more expensive, with a trailing P/E of 18.1 and a forward of 14.4. Here is one more table of assorted metrics for additional context on these stocks. It is sorted on forward P/E. Starting from the left, the beta 1-year column shows that most of the stocks in the list have a beta at or below 1. Both Target (TGT) and Verizon in particular have very low beta, meaning they move with significantly less volatility than the S&P 500, something that some risk-averse investors might prefer. With a 3.4% dividend payout that is growing modestly alongside earnings, TGT could be a high-yielding alternative to peers such as Walmart (WMT), which has heavy international exposure, and Costco (COST), which, like many consumer defensive stocks right now, is overvalued. The return on invested capital (ROIC) is a metric for comparing profitability. ROST, CALM, and HD are standouts in this column, but all of the companies are at least generating a positive return on invested capital. The next 3 columns provide insight into valuation. You’ll see that pricing runs the gamut, but most are well below the average S&P 500 P/E of 24.7. UnitedHealth Group (UNH) is at the top of its 5-year P/E range, meaning that right now might not be the best moment to get into this healthcare stock. But we think it’s worth keeping an eye on because of its excellent dividend growth, sales and earnings growth that is expected to continue, and industry-beating profitability. The final 3 columns in the table above give a taste of financial health. All of the stocks in this watchlist are currently free cash flow positive and have been in most recent quarters. Debt ranges, but the most highly leveraged companies also have strong interest coverage ratios, meaning they are more than able to cover their interest expense with their earnings (interest coverage is EBIT divided by interest expense). The watchlist is heavy in the consumer cyclical sector (AKA discretionary), because dividend growers tend to be disproportionately found in that sector, and many of the consumer cyclical dividend growers we found were US-oriented. Additionally, the US economy continues to show signs that it is stable and healthy, which is good for the consumer cyclical sector. However, it is worth noting that the sector as a whole has underperformed the S&P 500 over the past 5 years. It may be due for a turnaround, although it’s impossible to say when that might start. As of now, the sector is trending down relative to the S&P 500. While industrials also tends to house many dividend growers, a lot of dividend-growing industrials that we like (such as BA, MMM, and ETN) have high international exposure, which made them unsuitable for this particular watchlist. See our Dividend Growers portfolio for more ideas in the industrials and other sectors. One possible upside to the sinking bond market is that it may bounce money back into the stock market, which could help counteract bearish forces. In our Income Picks watchlist, we’ve given 17 long-term ideas for investors seeking some combination of dividend yield, dividend growth, earnings growth, and price stability. In addition to solid financials, all of these companies have modest to no international exposure, limiting the many risks associated with operating abroad given the stormy global economic environment right now. Keep in mind that, although we have done at least modest digging on all of these stocks, we have not thoroughly vetted them all, and we are simply passing them along as suggestions for your further consideration and research. Download the list from our Library.